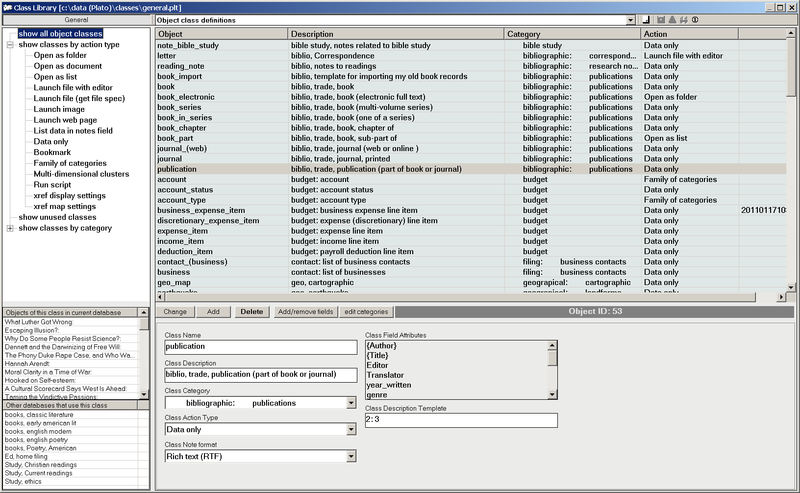 Plato has extensive features for creating, storing, and classifying metadata. Metadata is data about your data. 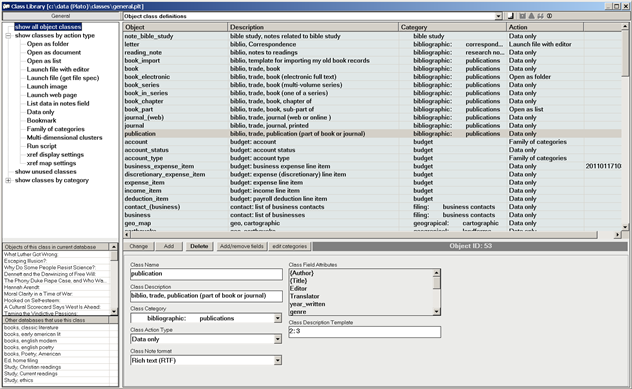 A note object, for instance, may have attributes such as topic, author, associated keywords, and date. A book object will have attributes such as author, title, publisher,and many more attributes depending on your use. These attributes are metadata. Plato object classes and metadata are flexible and powerful. You can easily build ad-hoc databases that are quite complex. You may build classes that refer to each other (simulating relationality) and have validated fields, text macros, and fields that display the results of calculations performed on the contents of other fields. Since Plato automatically keeps indexes of each object class, keeping your data in closely defined object classes is a ready-made classification method at your disposal. On the left hand of the pane is an object class filter tree (top) for organizing large numbers of object classes. Below this are two panes that show (respectively, top to bottom) the instances of the selected object class in the current database and all databases that contain instances of the selected object class.